The architect for the Robins Gardens project was in on Monday getting building permit for a construction trailer which has just been placed at the corner of Milton and Esplanade, and for the first condo unit, will go close to existing trees that are being saved on the north-east corner of site. The first building has a planned layout of 12 units, with parking under the building Owners will see how the market responds before beginning the next building; a total of 5 have been planned. Expect construction to start sometime around June. The planned 7-Eleven at Nicol and Milton has been reviewed by the Ministry of Transportation. They will not allow a right turn into the site from Nicol Street, but will allow a right turn out onto Nicol St.
City is continuing to work with Port Place Mall owners, nothing significant is happening. Planned apartment building at 275 Nicol Street. Building inspections is working with a prospective contractor, getting ready to go ahead. 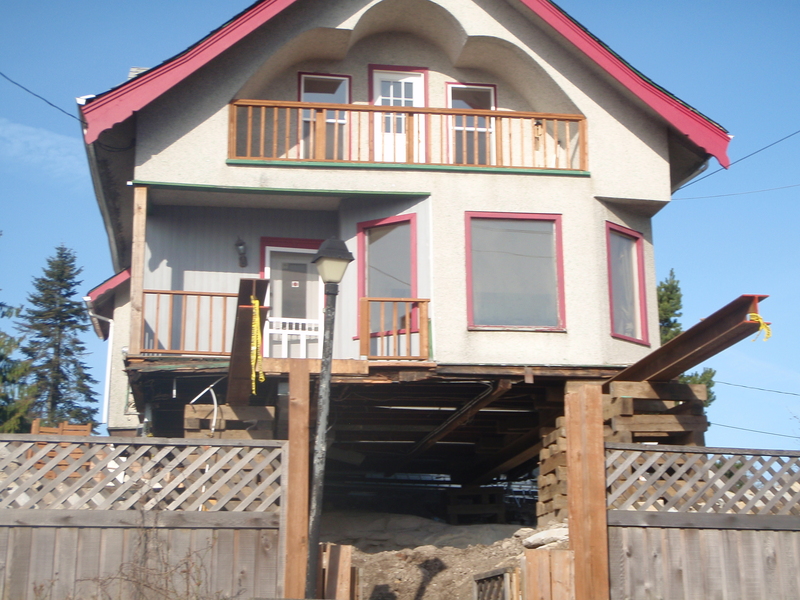 At 13 Haliburton, the character 6-plex still working on parking issues. Thanks to Gary Noble, Development Approval Planner, for the update. Movin' on up on Haliburton Street! Heritage and Community Planner Chris Sholberg is working on our draft Neighbourhood Plan, once it’s complete there will be an Open House of the community to attend. Stay tuned for more details. “Things have quietened down quite a bit, it’s nothing like it used to be. Both the RCMP Bike squad and ACT/Crisis Response team are doing good work.” He’s finding less loitering in both of the problem alleys: “People are not staying, they are on the move.” Derelict vehicles and foliage have been cleaned out of problem areas. Over 50 people showed up at the The Friends of Harewood Plains meeting on April 27. The objective is to preserve and protect the wildflower meadows on Harewood Plains. A slide show displayed destruction of this delicate region. There appears to a significant amount of interest in this area, home to a number of rare plant species, including the Lotus Pinneatis (showed above.) A May 1 article in the Nanaimo Daily News gives more info. Click here to read it. We are struggling at this time as are all forest industry companies. We were on reduced work schedules last Summer – early Fall but are back to almost full time hours. The market has picked up a little lately but we are still concerned about the outlook for the next year or two. We employ over 160 people full time. Our market is the Pacific Northwest area of the US and Western Canada. The energy system has been working well for a long time now. We have had excellent test results that last few times – well below our permit level. The combination of operator experience and knowing our variation in fuel moisture and operating parameters has made life a lot easier for us all. Thanks to Jack Stephens from Coastland for providing. Milton Street Fire Deemed Suspicious by Nanaimo Fire Rescue Investigators. City memo to the press. City Log: Project will help house homeless. CMHA announces new project on Wesley Street, city will help fund sprinkler system at the Balmoral. Port vision includes transportation hub. From the Feb 17 Nanaimo News Bulletin. What’s Up with Building Developments? The Condo development planned for 253 Victoria Road is tentatively scheduled to go before council for approval in March. The Good Samaritan House add-on that was presented at the February SECA meeting has been to the design panel. The builder is now dealing with some building code issues. Approval for the apartment building planned for 275 Nicol Street was passed a few weeks ago. No word on starting date. The condo planned for the MGM Restaurant site is on hold for now. Some interesting info on the planned Robins’ Gardens development. This will, apparently be a fairly cutting-edge development from an environmental standpoint. The developer has committed to saving as many of the trees as possible. The triangle at the end of the parcel will become a “visual amenity space” (hey, I don’t make the terms up, I just report them…J), which basically means the trees will remain, along with a see-through wrought iron fence with interpretation signs. I asked about a park space, but the problem is that the roots of the trees can’t withhold a lot of trampling and since the trees are rare, it makes sense to maintain them. The units will be 3 storey buildings with a Victorian look. Planned to be built one at a time. Building units were originally planned to be bigger i.e. 1400 SF, but the current demand in our area is for smaller units (starters/singles/retirees), so the unit size is being reduced, but will still be larger than some of the developments that have been presented to us recently. The 6-plex planned for 13 Haliburton Street, a creative use of space that was presented at our January meeting. Gary relayed that the developer really valued the input from residents. They are working on solutions specifically related to parking: for cars, scooters, and bicycles. Thanks so MUCH to Gary Noble, the Development Approval Planner for the City of Nanaimo. Both for taking the time to provide updates for us, and for helping developers understand how to “fit into” the South End. We get a tremendous number of people searching for information on Port Place mall updates on our site. So your intrepid reporter is doing a little digging and will attempt to provide ongoing updates. We’ll speak mostly to the needs of residents i.e. store openings/closings etc. and a little more generally to what is happening. According to the city, the development process is still in progress, constantly changing, nothing firm at the moment, ongoing negotiation. The overall design is still basically what was shown at the open house, the city says. To the best of my knowledge, that is a street running though from Nicol to the Gabriola ferry, with casino, 8 story residence and retail on one side and strictly retail on the other. According to the original plan, the 4 outlets that will be moving to the new development are Thrifty Foods, London Drugs, Medical Arts, and CIBC. Recent news about a possible transportation hub at the Assembly Lands may impact the overall development. Cruise ship, accessibility, traffic studies are all playing a role in the process. The Green Store is now located outside the mall near the casino. Canada Post and Liquor Store still operational. Coast Capital Insurance is now located in the new Conference Centre building, between Serious Coffee and Iris. The food court contains the Japanese stall and the coffee place. The Dollar store will remain open until they receive notice to leave. The inkjet cartridge people have moved to near Canada Post. No word from remaining retailers on when they will be asked to vacate, they have not received notice from mall owners. We’ll keep updating, so please, if you have anything to share with the rest of the world, post below. The Balmoral has made an application to CMHC for renovation of the rooms. The next round of renovations at the Balmoral include new exterior windows, completely new plumbing, new interior tenant suite doors, and some enhanced fire safety renovations. CMHA has been selected to manage and build the social housing project on Wesley St. They have started looking for and architect and contractor. The RFP (Request for Proposal) will go shortly. The CMHA expects timelines of 9 to 12 months to design and 9 to 12 months to build. Behind this initiative are Dr Jim Guild, a dentist in Ladysmith, Dr Frances Walsh from the Harewood Dental Clinic in Harewood, and Paul Manhas, the owner of the building who has provided the space for minimum rent. SPAC (Social Planning Action Committee) has provided $35,000 for start-up costs. The clinic will begin on a drop-in basis a few days/month. Thanks so much to John Horn, Social Planner for the updates. And to Cris Martens from the CMHA. Who would have known that 100 years ago Nanaimo was the most rad place in North America! 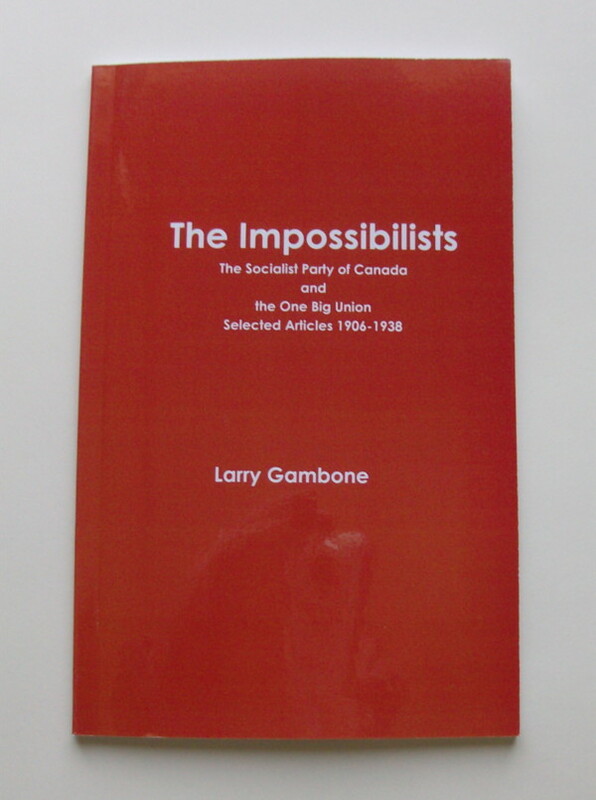 – something you will conclude after reading South End resident and SECA member Larry Gambone’s book, “The Impossibilists.” This little book is both an historical overview of Western Canadian radicalism, and a collection of articles taken from early socialist and labour newspapers. There are some surprises here for sure. One section is devoted to the writings of labour martyr Ginger Goodwin, out of print since about 1917.